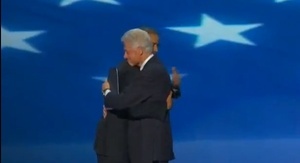 Bill Clinton and President Obama embrace at the Democratic national Convention last night following a 45-minute speech/endorsement by the former president. Forty five minutes. 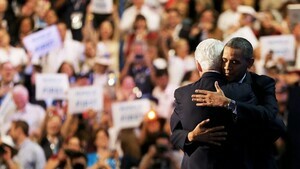 “Heck, he even appointed Hillary!” For Mr. Clinton, the speech dramatized the evolution in his relationship with Mr. Obama, from bitter antagonism to cautious embrace and now a full-throated endorsement. People who know both men do not play down the lingering tension between them, a legacy of the 2008 Democratic primary, when Mr. Obama defeated Mrs. Clinton in a fierce battle that seemed to leave Mr. Clinton more wounded than his wife. Posted in Misc and tagged Bill Clinton. President Obama at 7:47 am on September 6, 2012 by Broadsheet.